The Electric Kool-Aid Acid Test was written by Tom Wolfe. 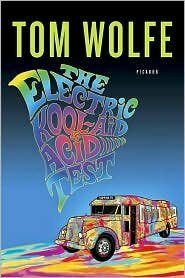 The Electric Kool-Aid Acid Test was published by Picador, New York. About Tom Wolfe (Author) : Tom Wolfe is a published author of children's books and young adult books. Some of the published credits of Tom Wolfe include The Right Stuff, A Man in Full, Ponche de Acido Lisergico. 2/10/2011 Laura Hadaway said: Definitely one of my favorite reads. I didn't know a lot about drugs, or groupies, or generally anything like that when I read this for the first time in the 10 grade. Its humorous explanation of that era opened my eyes and was incredibly entertaining.